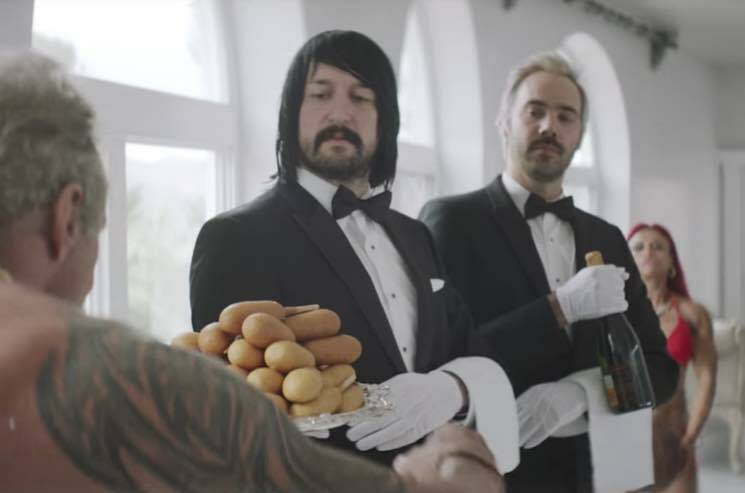 Death From Above officially dropped the "1979" from their name and returned with a fresh new single titled "Freeze Me" last week, and now that track has been treated to a music video. The accompanying clip was directed by Corey Adams, and it finds a gang of super-buff bodybuilders training and living lavishly in a fancy mansion. Between lifting weights and practising poses, they find time to splash around in the pool, chow down on corn dogs, make out with statues and rip a mean guitar solo. The band's Jesse Keeler and Sebastien Grainger are left to gaze upon all the action from the sidelines as the straight-laced, suited-up butlers. "When Corey Adams started talking to us about making this video he said he wanted it to be about how body builders would spend their last day on earth before the nuclear apocalypse," Grainger said in a statement. "He also mentioned there would be a guy dressed as Rambo playing a machine gun like an electric guitar and a lady body builder pumping iron under water. He had us at hello." Watch the video for "Freeze Me" below.